Chemotherapy is one of the most expensive medical treatments in the world today, but is it actually…effective? Thanks to alternative media and documentaries like the ‘Truth About Cancer’ series, more and more people beginning to question not only its efficacy, but also whether it actually does more harm than good. Believe it or not that questioned may have been answered more than 40 years ago, when a shocking study was released that could have ended the chemo experiment — if anyone had been paying attention. Dr. Hardin B. Jones, a former Professor of Medical Physics and Physiology at Berkeley, California, concluded after over 25 years of research not only that chemotherapy, radiation and surgery do not work and do not prolong a cancer patient’s life, but patients receiving these types of oncological treatments in many cases die much sooner than those who choose to be untreated. Treated patients also die a much more painful death. “People who refused chemotherapy treatment live an average of 12 and a half years longer than the people who are receiving chemotherapy,” wrote Dr. Jones in the journal of New York Academy of Sciences. 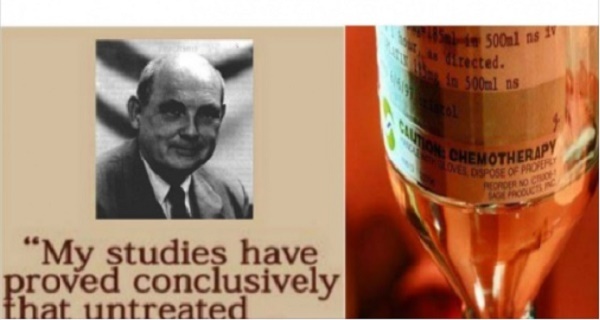 In 1969 he presented his research at the American Cancer Society’s Science Writers’ Seminar, and the unbelievable findings still send shockwaves through the cancer industry to this day. Because chemotherapy kills the healthy cells sooner than it affects the cancer cells, the body is left weakened and defenseless against the disease. Adding big side effects of the toxins of the treatment on top, the human body is left barely holding on to life with no immune system to heal itself. “It is not the cancer that kills the victim. It’s the breakdown of the defense mechanism that eventually brings death,” told Jones to MIDNIGHT. He and his wife considered what would they do if they were to develop cancer and both agreed that they would stay clear of mainstream treatments and instead do everything to keep the body in as healthy state as possible. Jones’ research showed great potential for nutritional treatment. Doctors A. Hoffer and Linus Pauling analyzed and reported on Jones’ multiple studies. The findings show that on average cancer patients who followed a regimen of vitamins and minerals had 4 times longer survival time than patients who were not following the protocol. Their conclusion was that all cancer patients need to start this protocol as soon as possible. For people who would like to prevent cancer, it would be beneficial to also be on the same protocol just using lower dosages. The regimen included: a daily dose of 12 g Vitamin C, Vitamin B3, B6 and other B-Vitamins, folic acid, Vitamin E, beta carotene, selenium, zinc, and sometimes other minerals (note: natural vitamins and minerals are almost always the best choice; not all are created equal). Other parts of the treatment were following a healthy diet, and taking care of the patients’ mental health. In 1969, American Cancer Society published Jones’ aforementioned presentation from the 11th Science Writers’ Seminar. Cancer biology was one of the main research topics for Jones and the subject of this talk. There is a strong link between carcinogens and cancer. Jones stated that the more the person was exposed to a carcinogen, the higher their risk of developing cancer is. Different carcinogens have a slightly different effect and timeframe, but the stronger the individual dose of carcinogen is – the less time it takes for cancer to develop. With so many carcinogens in today’s food, air and water, it’s no wonder why cancer rates been on the rise. Jones provides multiple example of errors in the data when it comes to comparing rates in survival of those patients who went through surgery and/or radiation versus those who were untreated. Most studies he had seen did not count patients who died before the completion of their treatment. Their deaths were omitted from the data as “rejected.” By defining two groups as treated and untreated, the treated group had to have finished the treatment in order to be counted in the study. The study looked at whether or not the patient survived after the surgery or operation was over, and those who died during these two types of treatment did not “meet the criteria” to be in the “treated” group, and were omitted. The longer the study was, and the more steps it had, the more errors were in the study, stated Jones. The complete list Jones’s papers (written over a 41-year period) is available online in The Bancroft Library of Berkeley, California. If you’ve ever met a cancer survivor you know that there are plenty of them out there who have undergone chemo treatments and survived (of course there seem to be far more natural survivors that are not counted). And with the right nutritional protocol, emotional support, mindset, and other factors it is indeed possible to live on and heal the body after chemo. That being said, key recent studies have not exactly been in chemotherapy’s favor. Even though some have defended the procedure because of recent “advancements,” the survival rate has remained questionable at best, if not dismal compared to natural and holistic treatments being undertaken at specialty clinics and in people’s homes. According to a major study conducted by the Department of Radiation Oncology at Northern Sydney Cancer Centre and published in the December 2004 issue of Clinical Oncology, chemotherapy’s real impact on the survival of American adults is a mere 2.1%, and that’s only for up to five years, not a “true survival rate.” With so much risk and so many nasty side effects surrounding chemo, do you think it’s worth the risk? For more information on the true history of cancer, you can check out ‘The Truth About Cancer: A Global Quest,’ airing for free online from Oct. 13-21. Click here to watch it. This article is for informational purposes only and should not constitute medical advice. It is not intended to treat, cure or prevent any diseases. Speak to a doctor before making any major changes.